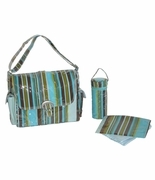 Cater to your little one wherever you go with our baby diaper bags. Designed for the active lifestyle of working moms. 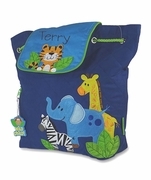 Pack this unique personalized baby bag for the perfect baby shower gift. Personalization available, first name or three letter monogram included with selected baby diaper bags. At Simply Bags, we may not be able to prevent kid-related meltdowns, but we can certainly help you cater to your little ones wherever you go by helping you easily carry your daily bare necessities. Our diaper bags are designed for the active lifestyle of modern moms, and are cleverly designed to do a whole lot more than just hold diapers. 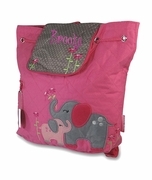 Whether you're after something simple like our carry-all Monogrammed Diaper Bag (which includes a diaper changing pad!) or a multi-tasking tote with easy-access utility pockets like our Cool Diaper Bag, Simply bags has something to help you through the day. Have someone in your circle of friends who is expecting a baby? A personalized baby bag from Simply Bags also makes the perfect baby shower gift for expectant mothers. As anyone with children will tell you, you can never seem to have enough tote bags to carry the endless supply of things for your children's tireless list of activities, no matter what age they may be. Personalization is available for a selection of our baby and diaper bags; choose from a one to three-letter monogram or name for that personal touch. Not only does personalization make for a great gift item, it also helps busy moms (who seem to always have their hands full) identify their bags at busy playdates, birthday parties, or other gatherings. At Simply Bags, we love hearing from our customers, so if you have a specific baby bag in mind, pick up the phone and give us a call!